As I've mentioned before pumpkin desserts are some of my favorites. I didn't use to think so, I was never a fan of pumpkin pie at Thanksgiving, I always picked apple. But in the past couple of years, I have really developed a taste for pumpkin. I realized that maybe it was just the traditional pumpkin pie I wasn't a big fan of; pumpkin bread, pumpkin muffins, and pumpkin cheesecake were all delicious. 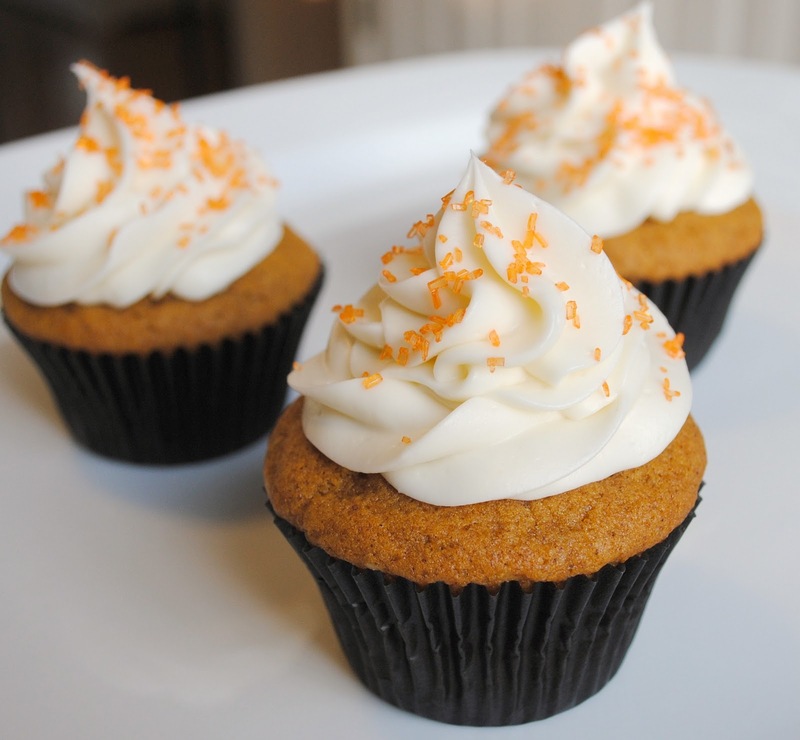 These pumpkin cupcakes are my new favorite of all of them. 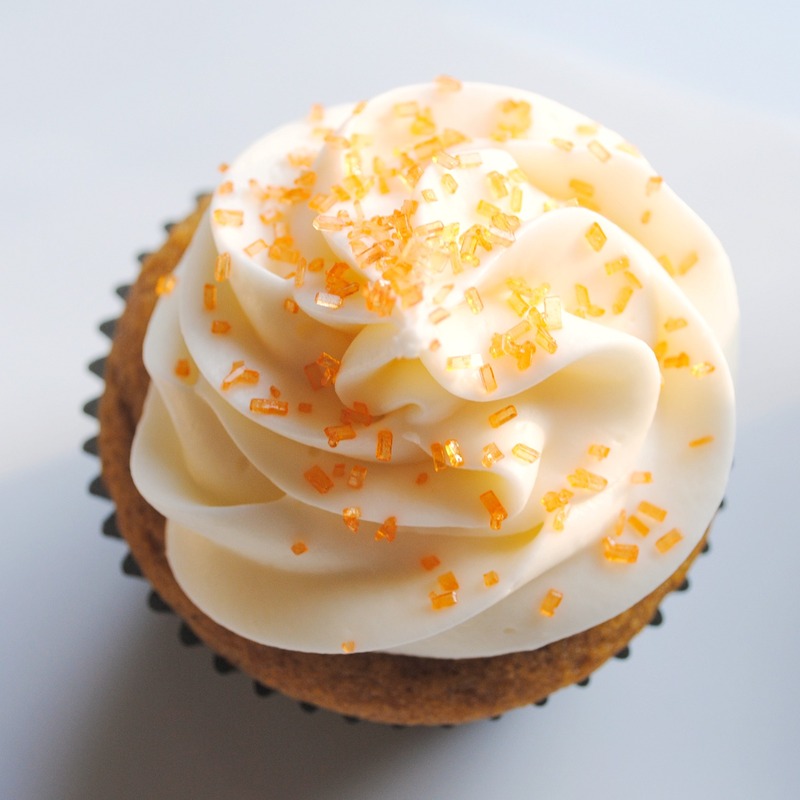 In fact, I think they are my new favorite cupcake overall. The cupcake part of these is a light and delicious cake. The pumpkin really makes a moist cake and the spices are perfect for fall. Your whole house will smell like fall within minutes of putting these in the oven. 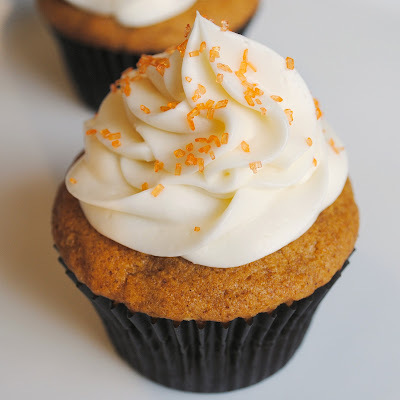 I frosted these with a classic cream cheese frosting which works perfectly with the pumpkin flavors. Top them with sprinkles, maybe some caramel sauce or those cute little candy pumpkins they sell this time of year and they are a perfect fall dessert. I actually found this recipe browsing at Williams-Sonoma in the mall. They had some seasonal recipe cards in the store and with all the fall scents that pipe through that place, this recipe quickly went on my short list of things to make. The raisins and walnuts made it seem more muffin like than cupcake like so I left those out but added a little ground ginger to the spices. Make sure you get pure pumpkin puree for this recipe and not the pumpkin pie filling in the can. Preheat oven to 350 degrees. Line 24 muffin cups with paper liners or spray pans with cooking spray. Combine flour, baking powder, baking soda, and spices in a large bowl. Whisk or sift to combine and set aside. In mixing bowl, cream together pumpkin, sugars, and oil. Mix on medium high speed about one minute until well combined. Add eggs, one at a time, beating after each addition. Add flour mixture in three additions, mixing on low speed until just incorporated after each addition. Fill cupcakes 3/4 of way full and bake approximately twenty minutes until a toothpick inserted in the center comes out clean. Cool in pans about five minutes before transferring to a wire rack to cool completely. Frost as desired. Combine cream cheese and butter and beat on medium speed for 2-3 minutes until light and fluffy. Add cream and vanilla and mix in until incorporated. Add powdered sugar, one cup at a time, mixing after each addition until well incorporated, to reach desired consistency to frost cupcakes. Pipe or spread onto cooled cupcakes as desired. I am definitely making these for Thanksgiving! It's now officially on the menu. These are so pretty! I love pumpkin! these look perfect. Great photos! In the oven right now! They are great (I already had one). I'm making minis for work. I think they'll be a huge hit! These are fantastic! They dome up soooo nice and they taste amazing! Do not overfill! The frosting is super as well. I added a bit more ps and held back on the cream just because I wanted to make sure the pretty piping wouldn't fall. I topped with a candy corn also. The mini ones are so stinkin' cute!